Ingredients: Water (Aqua), Niacinamide (vitamin B3, skin-restoring), Acetyl Glucosamine, Ascorbyl Glucoside, Butylene Glycol, Phospholipids, Sodium Hyaluronate, Allantoin, Boerhavia Diffusa Root Extract, Glycerin, Dipotassium Glycyrrhizate, Glycyrrhiza Glabra Root Extract, Ubiquinone, Epigallocatechin Gallate, Beta-Glucan, Panthenol, Carnosine, Genistein, Citric Acid, Sodium Citrate, Sodium Hydroxide, Xanthan Gum, Disodium EDTA, Ethylhexylglycerin, Phenoxyethanol. 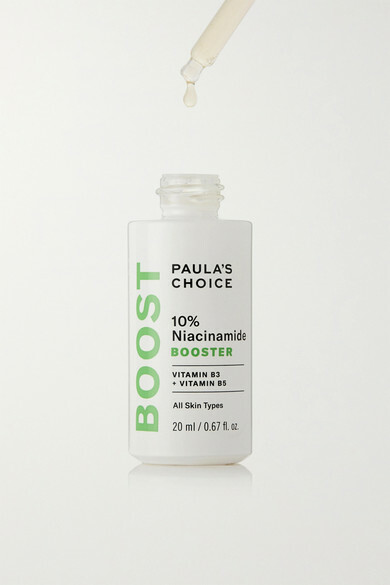 Paula's Choice's '10% Niacinamide Booster' is a multi-tasking serum that's designed to improve uneven skin tone. 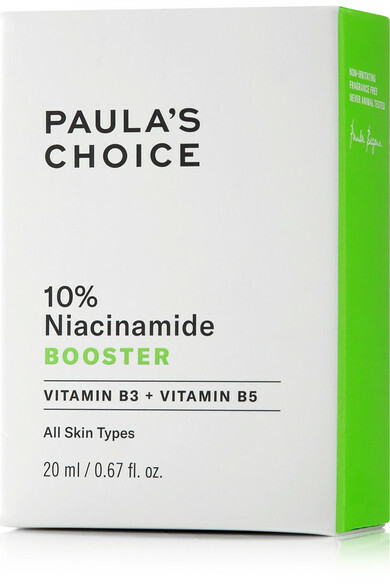 Infused with Vitamin B3, it works to reduce the appearance of pores and wrinkles, while a potent blend of antioxidants and hydrating ingredients soothe and moisturize. Use it every day to achieve a softer, more radiant complexion.